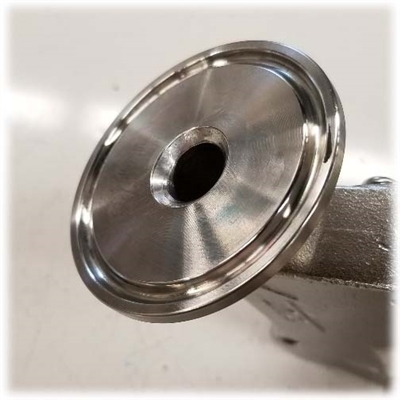 This is a 1-1/2" Triclover (TC) blank cap that has been meticulously drilled and tapped to NPT female thread to act as a very low profile adapter. (the NPT taper is most narrow on the mating side of the TC flange). Measures 2" diameter actual. 304 SS. We had these made for the thermocouple end of our RIMS tubes, but a secondary use we've come to appreciate is converting a chugger pump to have TC ports without exposing a bunch of threads to the liquid flow. Yes, you will have to use some teflon tape, but it's the best option short of solder or welding. If you do want to solder, this fitting also works well for that. NOTE: Our current stock of the 1.5" TC x 1/4" NPT version is exactly as pictured in the product thumbnail where it's just a clean through drill and tap. However, The 1/2" NPT and 3/4" NPT versions of this fitting are not fully tapped through. We intentionally leave a small STOP ledge at the sealing face in order to fully encapsulate the threaded area of the fitting that it is mating to. You can see an example of how it finishes after soldering in the picture below. If you do not plan to solder, the best way to get this to seal is to generously wrap your male threads with heavy duty teflon tape, allowing about 1/8" of it to overhang the ends of the male to make a face sealing gasket. I have converted three pumps with these. I can't say if it's better to have the sanitary over threaded but it makes me feel better to know nothings hiding and you can see that everything is clean. Used them to convert the threaded connections on my chugger pump to tri clover. I TIG welded them with 309 filler, ground flush and polished. Good thread quality and finish without scratches or dents. I had searched for this kind of product for a while but the only alternative I found was a complete pumphead replacement with tri clover ports and that was a bit pricy. I used two of these on my chugger pump head and TIG welded them on from the face where the threaded male ends come through the tapped adapter. great way to make a tri clamp pump head that has no threads exposed to liquid or anything to capture gunk and need taken apart and cleaned. Did the same on the male side of a welded on pull through bulkhead on a keggle to make a TC port for hoses on the outside, and use the threaded female port inside the kettle for a whirlpool arm. I recently purchased the 1/2" 1.5 TC Tapped Female NPT Low Profile Adapters for my March/Chugger stainless pump headend to complete my all triclover Brutus 10. The service was quick and accurate and it is great to be able to buy items from an organisation that understands advanced home brewer requirements. Using the Starbrite solder as per the product prescription made for an easy and perfect solution to compliment the pumps. Thanks a lot guys. Will certainly be back.